When someone is considering a home purchase, they may have specific things they are looking for in a property. They may be looking for a certain number of bathrooms or bedrooms, two car garages, updated kitchens and more features. For many people though, finding all those features in a property that will be a good investment is also an important consideration. Realtors® will tell you, and most people have heard it before – “location, location, location!” It’s true that a home’s location is a very important thing you should consider if you’re hoping to make a good investment. Northern Michigan properties can be highly sought after and for the most part, are considered ideal locations for serious home buyers. Not everyone wants to live on a lake, but for the thousands who do, location is importan. Northern Michigan can be a great place to buy a property if location is important to you. Michigan and its bordering states have the luxury of being nearly surrounded by water. With the Great Lakes and thousands of inland lakes, rivers and streams, it’s not surprising that people flock to Northern Michigan for its beauty and tranquility. Some of Northern Michigan’s most well-known, largest and most popular lakes include Higgins Lake, Houghton Lake and Otsego Lake. The area’s best recreational rivers include the Manistee River and the mighty AuSable River. Higgins Lake is located just five miles west of Roscommon in Roscommon County and has been referred to as one of the world’s most beautiful lakes. Higgins Lake was formed thousands of years ago when the glacial ice sheet retreated and left behind the cool clear waters behind. The lake is deep and home to perch, trout and pike, making it one of Michigan’s best fishing lakes. Many fishermen find the best catches in the Cut River which connects Higgins Lake to Marl Lake. Higgins Lake is busy all seasons for fishing, swimming, hiking, biking, cross-country skiing, boating and camping at the two nearby state parks. Houghton Lake is Michigan’s largest inland lake and offers some of Northern Michigan’s best outdoor recreational activities including fishing, kayaking, bird watching, swimming, sun bathing, jet skiing or tubing. Whether you’re an on the go kind of person or prefer reading a good book on Houghton Lake’s sandy beach, Houghton Lake is the perfect location for anyone who enjoys the water and nature. The AuSable River is a major tributary that flows out to Lake Huron. This 180-mile river is famous for its trout fishing and flows through portions of the Huron National Forest and the counties of Otsego, Montmorency, Crawford, Osco, Alcona, Roscommon, Ogemaw, and Losco. Kayakers and canoers consider the Manistee River to be the best in the state for day trips as well as multi-day trips that include camping at sites along the river. The many campsites make it possible to kayak the entire length of the Manistee. The stable but moderate flow of the waters make is a favorite for youth groups, families and scouting troops. As you float down the Manistee River’s clean spring fed waters, you can enjoy an abundance of wildlife including eagles, waterfowl, deer, beavers and other furbeares that make the river their home. Northern Michigan is more than just lakes and streams and pristine forests, as if that wasn’t enough. From the people who live there to the seasonal visitors, most folks will tell you that Northern Michigan is home to some of the nicest, most genuine people on the planet. It’s a place where people know each other and offer help to their neighbors. They say the people in Northern Michigan never treat anyone like a stranger, even if they are. If it’s activities and events you’re looking for, Northern Michigan truly has something for everyone. If you can think it, you can find it. If you like to hit the dance floor, there’s polka, line dancing and blues festivals. Then there are the annual art festivals, the farmer’s markets, and the festivals related to fishing, crops, foods and more. Festivals range from quiet and subdued to the wilder side like the Bud Bash on Houghton Lake. Wine tours and trails are becoming the thing to do and Northern Michigan is where you’ll find some of the best wines in the region. Grand Traverse is home to two of the Michigan’s federally recognized growing areas and Traverse City is home to over fifty wineries. Skiers who live in Michigan and surrounding states take advantage of Northern Michigan’s snowfall. The Great Lakes provide plenty lake effect snow that creates the ideal conditions for the many downhill resorts like Boyne Highlands and Nubs Nob. Equally as popular on a Northern Michigan winter day are snowmobiling, cross-country skiing and ice fishing. And in the fall the millions of acres of hardwood forests provide a color show that brings tourist from all over the state and beyond. They take deer season so seriously in Northern Michigan that they actually close many of the schools for the first day of hunting. Hunting is a Northern Michigan tradition and a paradise for the true gamers. Hunting and fishing are practically a way of life here, so much so that there are more than five different festivals, like Perchville USA, devoted to fishing alone. With so many people trying to lead healthier lives, getting out on the scenic trails in Northern Michigan has become a popular way to burn off some calories. Whether it’s hiking, biking or running, Northern Michigan has the trail for you. Some trails are over 200 miles long and run nearly the length of the state. Many of the trails are approved for horseback riding as well. As you can see, people relocate to Northern Michigan for many reasons. Some just want to get away from the crowded city. Others may enjoy all the amenities the small towns of Northern Michigan or the abundant recreational opportunities. Then there are others who just choose to live in Northern Michigan part time so they enjoy their favorite season or sport. Whatever the reason, Ken Carlson is here to help you find the perfect Northern Michigan property listing for you, in the perfect location. Property listings in Northern Michigan range from affordable vacant properties to small starter homes to luxurious riverfront estates along the holy waters of the AuSable River. The number of unique homes on the market at any time varies, but Ken Carlson knows where to look and if you know what you’re looking for, he will help you find it. 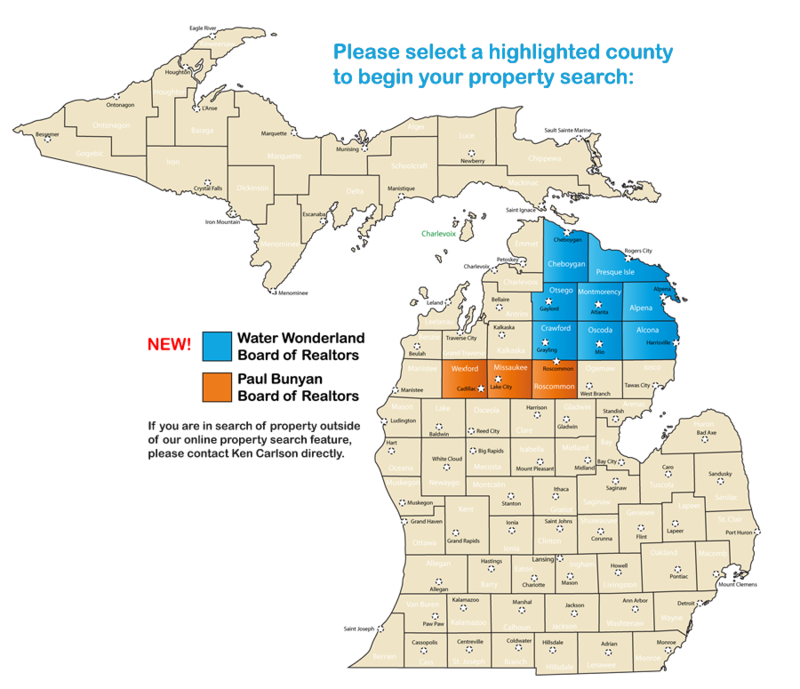 The counties within our property search area include the counties of Cheboygan, Presque Isle, Otsego, Montmorency, Alpena, Alcona, Oscoda, Crawford, Roscommon, Missaukee, and Wexford. If you would like help finding a home or property outside our property search area, call our office directly for more help. You can search our Northern Michigan property listings here on our website or call for additional help. Ken Carlson Realty is the right choice to help you locate the year-round home, vacation home as well as property of your dreams. Call Ken Carlson at 989.240.0970 for more information today. You can also contact us on line by clicking here.